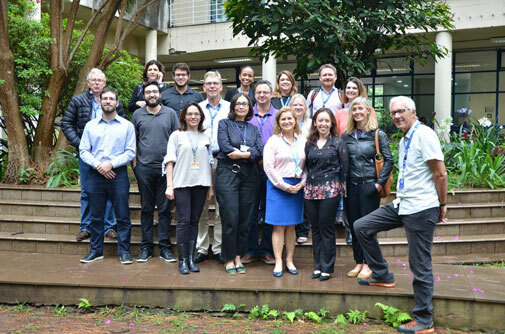 During the last week of October 2018, 18 researchers from Denmark and Brazil worked four days in an intensive workshop to develop a collaborative research project to curb the development of antimicrobial resistance based on the One Health principles. Six scientists in laboratory-based, clinical and social sciences research from University of Copenhagen met scientists with similar research profiles from the University of São Paulo, The Federal University of Rio de Janeiro and The Federal University of Paraíba. During the first day, focus was on identifying priority research areas and reflecting about the meaning and challenges of interdisciplinary research. The main outcome of the day was the identification of a common area of research that would benefit from a One Health approach. We identified a lack of knowledge of the dissemination pathways of resistant bacteria between the hospital and the community, as well as a lack of knowledge on the determinants for the dissemination within the Brazilian context, as critical areas of collaborative research. This knowledge is crucial to set up concrete and high-impact solutions to curb the development and spread of antimicrobial resistance. The second and third day we worked in small groups divided by the following areas of expertise human health and secondary care, human health and primary health care, animal health in which experts working with production and companion animals worked together. The social sciences scientists distributed themselves within the three groups. During these two days we drafted concrete research questions with an assessment of the human resources and capacity building strategies required for the development of the projects. The last day each group presented their ideas and the potential for synergy between the groups. Finally, we agreed on working together to find funding opportunities to continue the work initiated during the workshop. Further information regarding the Danish-Brazilian collaboration can be provided by the network coordinator, Gloria Cordoba, e-mail: gloriac@sund.ku. The workshop was funded by the Danish Ministry of Higher Education and Sciences, under The International Network Programme. This program supports the exploration of collaborative research in countries with growing economies, among them Brazil.